So, Konosuba ended this week, marking the beginning of the last hurrah for the surprisingly good Winter 2016 season and inviting all of us to look ahead to the upcoming bounties of spring. But before we allow Winter 2016 to give up the ghost, let us remember the good times we’ve had (and are still having!). The aforementioned Konosuba left us first, thanks to its tragically short 10 episode run (thankfully, we already have a season two coming our way). It was pretty much a vintage Good Konosuba episode, complete with great Aqua moments of both the triumphant and not-so variety, some explosions, and Darkness even showing a bit of legitimate character! I’ll reserve my overall thoughts on the show for a later date, but as finale episodes for episodic comedies go, I dunno if you can do much better than Konosuba did. It checked all the boxes of a grand finale without forgetting its greatest charms, which was delightful to see and experience. And, unlike some of the other episodes, this one was mostly devoid of wider satirical comedy, although the complaining of the wizard over not being granted enough funds to actually complete his assigned government project seemed to have more than a shade of real world commentary. And, to close out the Konosuba section, remember: Aqua is the best. Haikyuu!! S2 officially still has one episode left, but given that an S3 is coming and there’s not enough time to really get into anything else, I think we can more or less consider this somewhat disappointing season of cute volleyball boys close. And that feels weird to say, because Haikyuu!! ended the Karasuno–Seijoh match with what was, hands down, the sequel series’ best episode. Although Karasuno won, it was really Oikawa (that point to Iwazumi!!) and Seijoh who stole the show for me. At some point in the middle of this episode I forgot I was watching a story and started reacting to the episode as if it were a real sports game—complete with the intense bitterness over Seijoh’s loss that I feel when my real life sports teams lose. Oikawa’s not a genius, but he has worked harder than anyone to hone the talent he does have and so it hurt to see him downed by plot and circumstance so Karasuno (who have really become pretty dull as a unit, in my opinion) could truck on. Well, you can’t win them all. One clear winner out of this week’s crop of episodes, though, was Grimgar, which successfully closed the emotional-personal side of Mary’s arc with grace and then shifted quickly to give Ranta the long-coming character redemption he’s deserved. I was talking with a friend on Twitter about Ranta earlier this week and we were both in agreement that we really don’t want Ranta to die. As I see him, he’s just as much of a scared kid as the rest of the crew—and just because he’s a jerk and a wannabe peeper doesn’t mean he’s rotten to the core. In fact, this week proved my suspicions correct that Ranta would sacrifice himself for the rest of the party if needed. I’m glad they’re going to be coming back to get him and that he’ll likely live, because that seems like the necessary conclusion to Grimgar‘s season-long musings on understanding others. Akagami no Shirayuki-hime continued its own (albeit somewhat shorter) streak of success with a hilarious comedy episode this week that not only provided laughs, but also left us with a whole lot to think about in terms of the ways these characters relate to each other. There’s a lot of love between Zen, Mitsuhide, Kiki, Shirayuki, and Obi, but there’s also loyalty and kindness and friendship. It’s a whole range of good relationship behaviors and attitudes piled together, but I think it’s notable that even in the midst of this Zen and Mitsuhide can find room for a petty fight. Love and trust aren’t automatic antidotes to all relationship woes—even a well-established relationship will always need constant work to stay afloat and healthy. But, to come back to the main quintet, I have to say that my favorite thing about this episode was how everyone was present as Shirayuki passed her exam. Everyone was right there alongside her. It wasn’t overdone or dramatized. It just was. And it was lovely. Somehow Showa Genroku Rakugo Shinju finds itself all the way down in the middle of the post again this week—and once more, that is absolutely no comment on the episode’s quality. It was a bit lighter in tone, but the things Rakugo Shinju do are all important, even down to Konatsu being a cute little thing and getting her haircut and having rakugo performed for her. In a way, she represents the fascinating ideal of the audience, an innocent, perpetually entertained, fresh, and bright image. But the flipside to Konatsu is, in a weird way, her mother, as Miyokichi incarnates the angry, damning, unforgiving audience. They both give and they both take and they both have their reasons. Tragedy’s grim specter hangs over the theatre of life once more. I can’t keep writing paragraphs on how wonderful Mahoutsukai Precure is, but here I am again, this time to praise how the show is handling its multiple henshin sequences. This week’s Sapphire was definitely my favorite of the three we’ve seen so far, but what really struck me when watching was how different it was from the other two. Not just because of the colors or the animation, but because it had an entirely distinct feel to it. It was elegant, graceful, and dignified, a nice contrast to the bombast of the Ruby henshin and the crispness of the Diamond henshin. We’ve presumably got a whole bunch more of these henshin coming with numerous Linkle Stones left, and I’m really excited to get to see what the staff can continue to cook up for Mirai and Riko. And in the overtime round, we have Durarara!! x2-3 well and truly plunging into an inscrutable muck of character motivations. If Mikado has been slowly going insane, the show’s done an absolutely horrid job of cluing us into that. And if he’s doing it for some reason, it’s done a similarly terrible job making those motivations clear to the audience. My hopes for a satisfying conclusion have been pretty much dumped. GATE‘s paradrop episode was dull and featured infuriating blushes from lady knights who shouldn’t be blushing, while ERASED continued its slow march towards irrelevance with more entertaining-in-the-moment thriller camp and sadly abbreviated emotional material. And that’s all from me! Let’s gear up for a week of finales! Shouwa was lighthearted this week and Konatsu is one adorable little kid. I love her so much! ERASED was a little meh for me this week though. I’ve heard that a lot of parts were skipped? It was pretty okay compared to the other episodes. And yeah, I’ve heard ERASED has skipped a ton of material all over the place. An okay episode, as you say, but nowhere near as good as it was at the beginning of the season. 2 small things about this post I’ll ask about/comment on. Have you seen any other Precure? MahoTsukai is super good, so is it a lucky entry point to the franchise or are you a “veteran” fan? The only point of yours I disagree with is Durarara. But I’m not here to argue, I’ve seen similar arguments all over. I have a question tho. See, I missed the DRR! boat in a big way, and only watched season 1 and 2 these past 2 weeks in preparation for the finale. I came away from that experience feeling like I had a handle on everything, and knew where everyone in Ikebukuro was coming from motive wise— which seems to be a really uncommon opinion. Is that all it is? that I didn’t watch it week to week? I wonder if there’s a post in there: contrasting modes of watching, how that affects shows. Like ERASED obligatory cliffhangers would feel silly when strung back to back. I’ve seen Heartcatch and a little bit of Smile, but I wouldn’t really call myself a veteran Precure fan. The franchise definitely does have a lot of points to it that I really like, though, so it’s probably a bit half and half as to MahoPri being a lucky entry point or not. I also marathoned DRRR! !‘s first season, but I’ve watched all of x2 weekly. I wonder if that’s just not the ideal way to watch the show. I do think some shows lend themselves better to being watched all at once, while others (Precure might be a good example) are better weekly. Akagami no Shirayukihime ep 11; I have to say this, at least they’ve been consistent this season… once again, Shirayuki is a background character and the bulk of the episode is dedicated to telling us things we already knew. The big loss this week was that due to spending too much on irrelevancies Shirayuki’s Big Moment, becoming an Official Court Herbalist, was shoehorned in at the end and after falling completely flat was cut short by the ED. AOKANA ep 10-11; A bit off in pacing the last couple of weeks, but still coming in strong. There were complaints in some quarters about the matches being cut short this ep, but really they had a lot to pack in to set up the final match… so, no big deal for me. The most interesting thing was that even though Tobisawa-senpai lost her match, they showed us that Inui can be rattled… will Kurishina be able to capitalize on this next week? I look forward to finding out. And though she’s been pulling ahead all season, and barring a meltdown in the final ep, Asuka truly is this seasons Best Girl. Dimension W ep 11; More pointless talk, talk, talk and sudden reveals of both completely irrelevant stuff and stuff that a better show would have long ago foreshadowed. ERASED eps 10-11; Episode 10 was really a let down in quality and typical of the meltdown that characterized the middle of the show… But ep 11… ep 11… just simply wowed me. That was a pretty neat trick for solving the puzzle we’ve all been anticipating, how Satoru was going to travel from 1988 to 2003. The juxataposition of his outer (adult) self and the his inner (child) self in the first half of the episode was especially well done. The cliffhanger was a bit weak though. But whatever happens next week, this moment was the payoff. I’ve watched this scene half a dozen times now, and it will stay with me for a very long time. Gate eps 10-11; Lots of action setting up for a big finale. Will they resolve everything or leave things mostly set up for a notional third cour? I really don’t care so long as that smirk is erased from Tyuule’s face. Grimgar of Fantasy and Ash ep 11; Almost impossibly, Grimgar exceeds it’s previous standards and sets another high water mark. 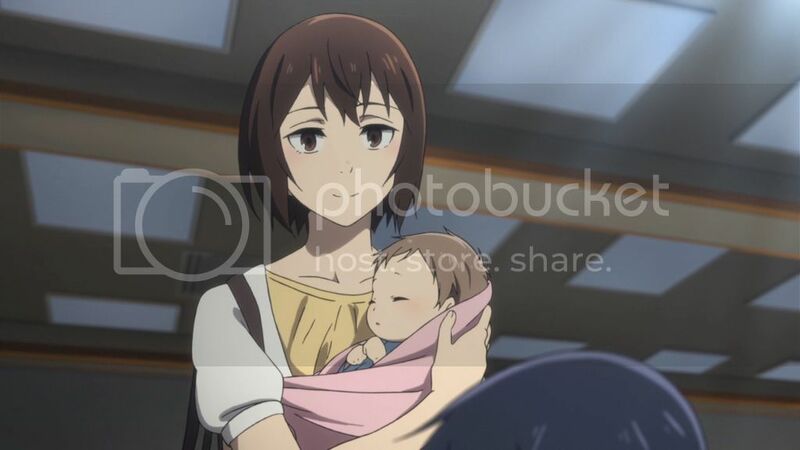 Mary’s catharsis and the closing of her arc was handled with outstanding style and grace and the sensitivity that has marked Grimgar all season. Even more so than Manato’s funeral, the link to “_and Ash” was made starkly clear. And Ranta – we saw him in his purest form, a huge jerkass who can’t be bothered to play well with others, but who refuses to let those same others down. Is it too early to say they left what could be the best character arc for last? Gundam Tekketsu ep 22-23; It seems to me that IBO really has lost it’s way… There’s too many threads left dangling to wrap up satisfactorily in a single episode, and they’re introducing too many new themes way too late in the game. KonaSuba ep10; The grand finale… and what a finale it was. The stumbling, bumbling crew managed to pull it out once again in their own inimitable style. Like Bless, I’ll save my comments for the season ender post next week. She and Her Cat: Everything Flows ep3; Wow. For a show with such a simple premise, it’s really hitting all the feels buttons. It’s hard to describe, but extraordinarily worth watching. I don’t really think we’ll see much of an arc from Ranta. He should grow, but the show doesn’t need him to. In fact, it’s probably better if he doesn’t in that sense. I reaaaally wish I could have been totally on board for the Kayo-Satoru reunion, but I just wasn’t. My genuine emotional investment in this show is long gone, and it’s probably not coming back. I certainly don’t hate the show and there are still things I like about it, but it’s chances of really sitting with me for a long time? Dead. She and her cat: wow, yeah, all the feels indeed. That feeling of displacement and loss when you’re in your early or mid twenties and are sort of done with university and looking for a job and not quite sure of what to do now with the rest of your life. Combine that with seeing a beloved cat growing older and you have a rather melancholy show. But you know which show has continuously impressed me this season? Oshiete Galko-Chan. She and Her Cat is really excellent. The control over atmosphere and mood is stunningly good. Oshiete Galko-Chan has ended up being oddly profound for all it’s bodily humor. In the comedy department it has overtaken Konusuba by leaps and bounds over the season. Matter-of-fact candor vs really creepy sensationalism. She and her Cat is an incredible mood piece and a beautiful Animist meditation. I love it.